Please note that we do not use in writing KVL. Because it is unknown. Instead, we use which does not add any extra unknown to the equation. "Please note that we do not use V 2 in writing KVL. Because it is unknown. Instead, we use R 2 I which does not add any extra unknown to the equation." Could you please elaborate on why we can not use the assumed direction of V2 on this point? It's been cause of considerable confusion. 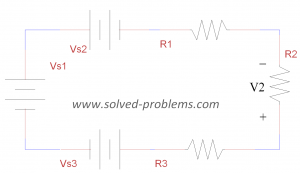 If when we solve for a single loop KVL (where all but one voltage is given), we can assume a direction for that unknown voltage and then solve for that voltage. 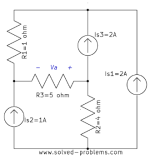 The direction of that voltage will be corrected with the KVL formula. However, when we need to solve for I, we can no longer assume the direction because otherwise the current will not be correct. 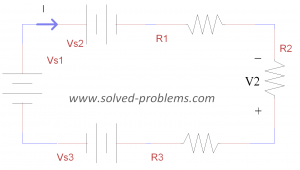 Why doesn't the KVL hold when we simply replace the voltage unknown for what it is V=IR?